Homes get messy when there’s a lack of systems and storage to keep areas free. I’ve been getting pretty frustrated lately because due to our renovation project and the lack of built-in storage and places to put things right now – I’ve been running around like a madwoman trying to contain all the items a nice built-in wardrobe or cupboard normally would! I’ve been driven mad by this and with a little bit of time up my sleeve (due to the school holidays) – I’m taking control! This is the first in a series of posts on how to get your home in order if you have a lack of storage, whether you are renting or in a renovation like me. 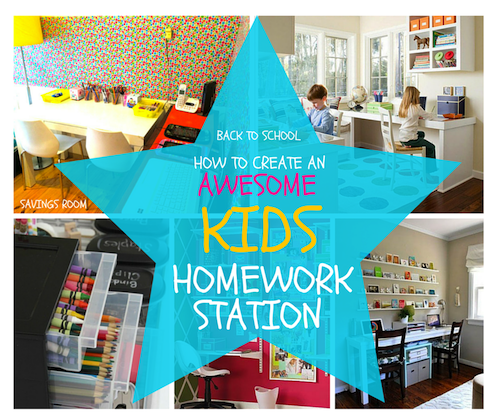 First stop is my back to school project – the kids homework station. Prior to creating this beautiful room (which I am now so in love with – I want to use and live in it myself) our living room and second living area was a mess. We were struggling on school mornings because all my kids’ important and regular items were at the end of a long hallway and far from where we would regularly use them. See below for the inspiration, tips and my experience with building this lovely room for my kids. My home’s hallway is so long I clean my home with a trolley! I love the functional and time-saving ability of a trolley. Trolley’s are also great if you are limited on space or you need to move your office around from time to time, which can be the case in modern space-deprived living areas. Just like adults, kids need daily inspiration and motivation. 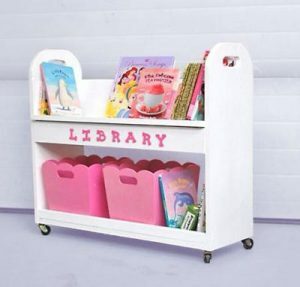 Make your kid’s homework station a colorful and happy place to visit. Personally, I didn’t want to put too many distractions in the room and as you’ll see below, I’ve maintained the happiness without the clutter! However, depending on the needs of your child, place wall charts or items according to what they might be studying or focusing on. I couldn’t really achieve this in the small space I had, however I each child did receive their own seat, which was great! 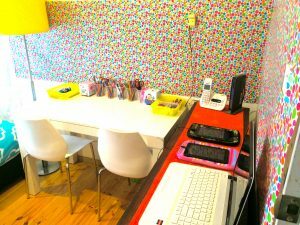 We have to be grateful for the little mercies 🙂 Still, my space looks cute and it is highly unlikely both my children will share the homework station at the same time due to their age differences (10 and 4). Do what works for you and your space. Kids bedrooms get messy on a daily basis. 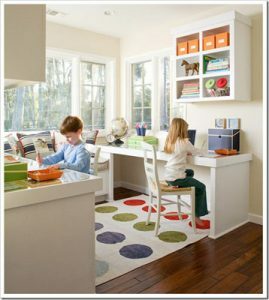 The goal should be to create a separate space for the homework station so kids will always have a clutter free zone when doing home. This is a great idea, which I hope to implement soon. Mine will include homework only as I prefer to keep kids notes on my desk for when I need to do admin. I keep a folder for each child on my office desk so I can quickly check what needs to be done for them – when I am organising other family administration jobs. Alternatively do something cute like this. 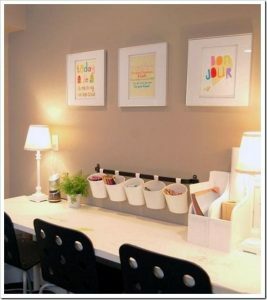 A simple space for kids to place their homework once taken out of their bags. If you are very short on space you can easily make your child’s homework more enjoyable by creating a little box like this. This can be placed on the kitchen counter or dining table for when your child is doing homework. 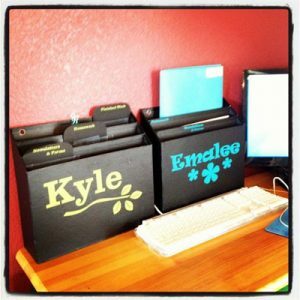 Setting up little systems like this will help your child feel focused, happy and loved! A place to dump digital devices, cords and headphones. 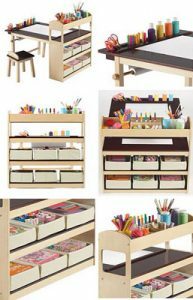 A highly functional kids homework station should give your kids access to their stuff. Make sure the items are within arms reach. See below for some fabulous storage ideas. 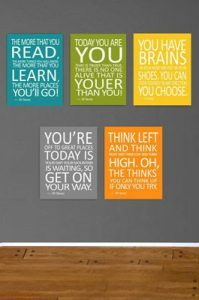 Hang some motivation on the walls. Give your children some affirmations and sayings that will stay in their minds and keep them focused even when they are not doing homework. Keep their minds active and inspired daily. I suggest changing the sayings every season – to spark new ideas in their active and growing minds. Note: Work in progress for me! As mentioned above – keep the space clutter-free. 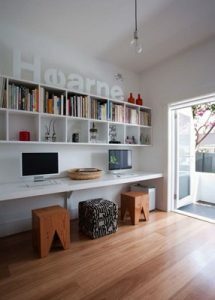 Make sure that the space itself is not too cluttered up with stuff. Keep the design as minimalist and distraction free as possible. 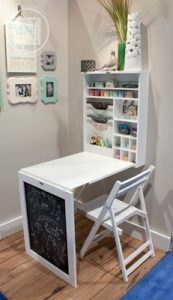 I like this idea for a small hidden homework space. It works if you are short on space! Get someone handy you know to build it or check out places like Ikea for solutions. Library books are easily lost around a busy home – so create a spot for them. If you don’t have a caddy like this and are on a budget – do what I did and use a simple bag hanging on a door. I recycled a cute nappy bag to keep my kid’s library life in check. Scroll down to view our new amazing home station! Note – Due to renovation the area had to be temporary!!! I have two children and I live in a six bedroom house (sounds great – but cleaning is harder!). The living areas of our home are starting to take form but bedrooms are located at the front of the house where the renovation hasn’t started. I’ve chosen the guest room, which is closer to the living/ kitchen area as it is quiet but not so far down the hall (which is long) my children can still access me for questions. It also has a relaxing view of the park next door. I like rooms with a multipurpose. Since guests don’t stay all the time – this room now works as a double-whammy. When we do have guests (usually my mother or mother-in-law) tend to visit out of school days and hours anyway – so in theory, this should work! Plus my guests get a bit of a ‘hotel’ feeling when they stay because they get a nice lamp, desk, stationary and a happy place to relax in! My simple and functional kids homework station! Copy and paste my notes section – remove my notes and add your own. You’ll have this job stitched up and fast! 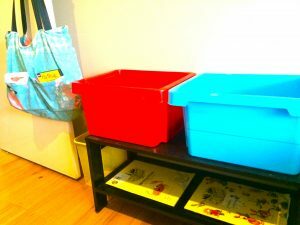 Stay tuned – I’m getting my renovation zone decluttered one room at a time. I’ll be posting all my projects from summer 2014 / 2015 soon. 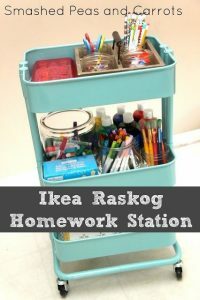 Don’t forget to check out my Pinterest Board below for other great ideas for creating a homework station! Follow Savings’s board HOMEWORK STATION on Pinterest.